Lucy knows that kissing Tom Lemmings behind the ball shed will make her a legend. But she doesn’t count on that quick clap of lips propelling her from coolest to lamest fourth grader overnight. Suddenly Lucy finds herself trapped in Dorkdom, where a diamond ring turns your finger green, where the boy you kiss hates you three days later, where your best friend laughs as you cry, where parents seem to stop liking you, and where baby sisters are born different. Now Lucy has a choice: she can be like her former best friend Becky, who would do anything to claim her seat at the cool table in the cafeteria, or Lucy can pull up a chair among the solo eaters—also known as the dorks. Still unsure, Lucy partners with super quiet Sam Righter on a research project about wolves. Lucy connects her own school hierarchy with what she learns about animal pack life—where some wolves pin down weaker ones just because they can, and others risk everything to fight their given place in the pack. Soon Lucy finds her third option: creating a pack of her own, even if it is simply a pack of dorks. 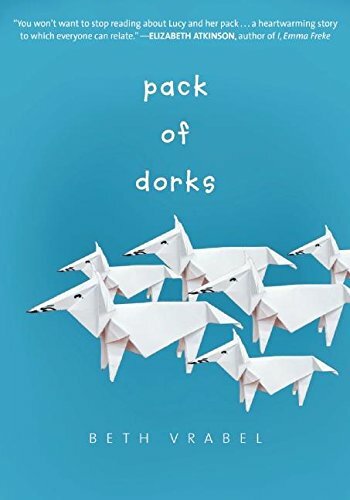 Lucy and her pack are back, in this sequel to Beth Vrabel’s heartwarming and humorous debut, Pack of Dorks. Sheldon convinces Lucy, Sam, April, and Amanda to join him at a weeklong sleep-away summer camp—Camp Paleo: Live Like a Caveman. Like cavemen, they’re going to have to make do without air conditioning or a heated pool. They’ll learn archery and dig for fossils. And Grandma’s coming too; she’s taking a job as lunch lady for the camp next door. At the last minute, Sam backs out to go to a gymnastics training camp instead. Lucy wonders why she misses him so much—it’s not like he’s her boyfriend or anything. Why does the word “boyfriend” make her blush, even when she’s only thinking it? She needs a distraction. Enter Mr. Bosserman, the grouchy camp leader who won’t budge on the caveman aspect of the camp. The old man needs some softening up, and Lucy knows just the person for the job: Grandma. One successful match made, Lucy starts to see potential lovebirds everywhere. And setting up couples keeps her from facing the question tickling the back of her mind: Is she in love with Sam? But when the wrong campers fall for each other, the pack falls apart, all under the watchful eye of a super secret blogger who’s been writing about the camp’s activities Gossip Girl–style. Even worse? A thief is targeting everyone but Lucy, setting her up to look guilty. Soon Lucy again finds herself alone, left to fix the messes she’s made and face her own feelings. If she fails, the pack may be splintered for good. 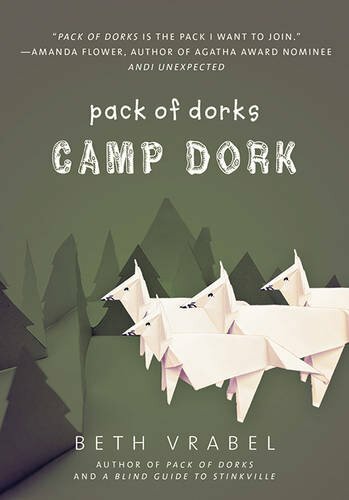 Don’t be a dork! 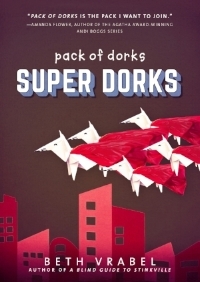 Be a SUPER DORK! to be a super hero! Lucy loves her best friends—her pack of dorks. But this year, everyone in the pack has become a hero . . . except for her! Sam rescues twin toddlers about to get hit by a car. April helps bring about the downfall of a ring of bicycle thieves. Sheldon and Amanda launch a campaign to protect turtle eggs laid on the school playground. Even Lucy's new teacher asks the class about their bravest moments. But Lucy's not brave—she doesn't even like to go to the basement by herself! So Lucy decides she's going to do something heroic. She'll be a super dork! This might be her chance to find her awesome. Unfortunately, all her attempts to help save the day seem to go awry, and usually end up making the situation much worse. Is ordinary dorkdom her destiny—or can Lucy ever find a way to be a hero? Click on the image for buying links!